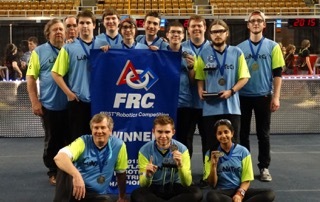 FIRST® Robotics Team 316, the LuNaTecs, brought home the gold medal in the FIRST® Mid-Atlantic District Championships at Lehigh University in Bethlehem, Pa. on April 11. The district championship culminated a seven-week qualifying process during which the field of 120 teams was narrowed down to 54. The LuNaTecs were seeded 18th going into the championship and finished third overall for the season after taking home gold. The district championship qualified the LuNaTecs for the world championships in St. Louis, April 23-25. However, due to funding issues, the team will not attend this year. 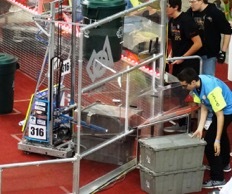 Team 316 is part of South Jersey Robotics (SJR) Inc., a nonprofit started in 2008 to help support Science, Technology, Engineering and Math (STEM) in southern New Jersey. Today, the organization sponsors 10 community robotics teams in middle and high schools, engaging more than 70 students. Through partnerships with Salem Community College and Cumberland County College, corporate partnerships with DuPont, Boeing and PSEG, and local business such as Warner & Co. CPAs, and government such as City of Bridgeton, SJR is striving to double the number of students and teams in the next several years. Continued support from local communities is the key to these teams’ successes. To show support and to learn more about being a sponsor, mentor or to join the teams, please email South Jersey Robotics at sjrobotics@gmail.com.